An Area of Concern (AOC) is a location where environmental quality is degraded compared to other areas in the Great Lake Basin resulting in the impairment of beneficial uses. A total of 43 AOCs were identified (see the map below) as a result of Annex 2 of the Great Lakes Water Quality Agreement (GLWQA). 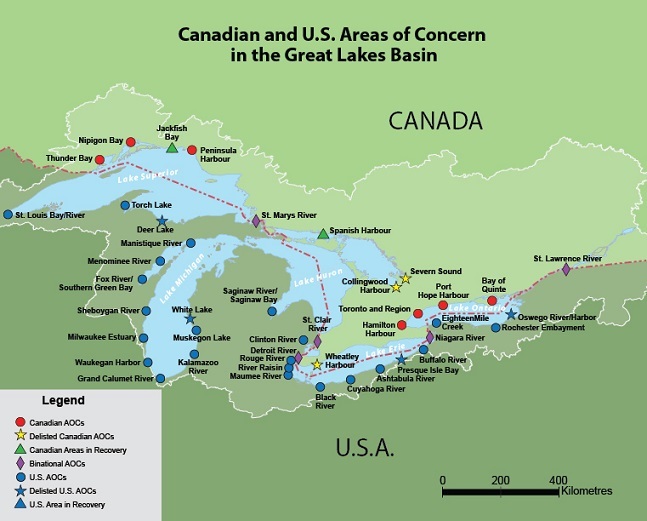 In response to environmental degradation around the Great Lakes basin, the Governments of Canada and the United States signed the Canada-U.S. Great Lakes Water Quality Agreement (GLWQA) in 1972. The GLWQA commits both countries to work cooperatively to “restore and maintain the chemical, physical, and biological integrity of the Great Lakes System”. During the same period, Canada and Ontario committed to fulfilling Canada’s obligations under the GLWQA through the Canada-Ontario Agreeement (COA): Respecting the Great Lakes Ecosystem. The COA was most recently updated in 2014. The GLWQA calls for localized, concentrated efforts to restore the 43 degraded locations through the development of cleanup plans (or Remedial Action Plans, RAPs. An individualized RAP is required for each AOC. The ultimate goal of the RAP is to identify and complete restoration actions in order to remove an AOC from this list. The process of removing an AOC from the list is called ‘delisting’. 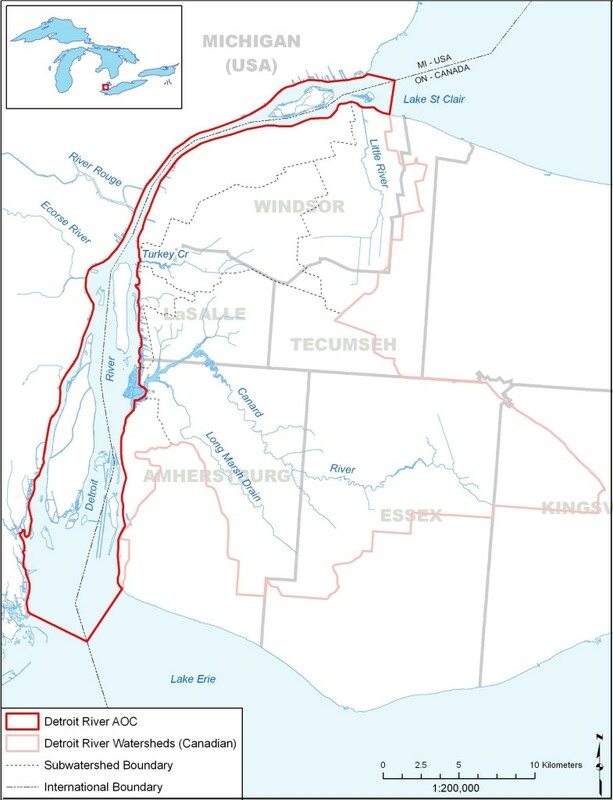 Delisting occurs when all locally-defined actions are completed and the Governments in both countries agree that scientific evidence shows the location is no worse than other Great Lakes locations and that there is local, public support in favour of delisting. The Detroit River is a 51 km-long connecting channel that links Lake St. Clair to the western basin of Lake Erie. Its width varies considerably from 600 m at the Ambassador Bridge to over 6 km where it empties into Lake Erie. Water depths range from an average of 9-15 m in the upper river to 3-9 m in the lower river). The Detroit River Canadian AOC refers to the Canadian portion of the Detroit River proper. Issues facing the Detroit River are combined sewer overflows, urbanization and land use (degradation of habitat), and toxic contaminants (e.g., mercury, PCBs, PAHs, and metals) in water and sediment. These environmental issues have been identified as being related to, or the cause of, the impairment of several beneficial uses.